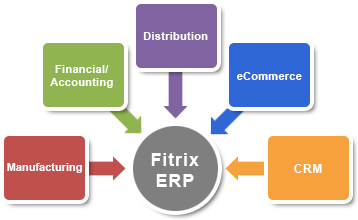 Fitrix ERP is a fully integrated, full-featured, industrial-strength suite of Enterprise Resource Planning (ERP) software applications designed to meet the needs of small and medium-size manufacturers of electronics and electronics related products. Fitrix ERP is built on and leverages “rock solid” technology that has performed with hundreds of concurrent users very reliably and with little required maintenance. That’s how we can speak with confidence that Fitrix will perform for your company day-in and day-out, virtually however many users you add and however much your needs may change over time. Fitrix ERP allows you to automate the sending of batches of documents like invoices, statement and purchase orders via email, fax and printed form using our Flexible Document Delivery (FDD) feature. FDD lets you set customer and vendor preferences so that they receive documents like these the way they like to receive them, or the way you want to send them. FDD is a powerful feature that lets you process an entire ‘run’ of documents, which each being delivered as specified in the customer/vendor profile (including multiple methods like email AND fax). Flexible Document Delivery helps save time and money by leveraging technology and enhancing human productivity. Fitrix ERP is designed to make it easy for you to support your multiple language needs by storing character strings displayed by Fitrix applications in the database using a language key. Fitrix tools contain an interface for easily converting default messages (in English) into other languages. In addition, any number of different language versions can be stored. By following the documented guidelines for creating language independent applications, you can provide users the ability to run applications in any language needed, even with different languages concurrently. In addition to single-byte character sets, Fitrix ERP applications can support multi-byte character sets such as Mandarin or Kanji.